The Emblem of the Rose Cross is one of these divine symbols. The Western Mystery School (that of the Rosicrucian's) has as its Emblem the red roses (symbolic of the purification of the desire nature) on the cross (materiality), the golden five-pointed star (showing that the Christ is born within the disciple and radiates from the five points which represent the head and four limbs), and the blue background (symbolic of the Father). The colors represent God in manifestation: unity in trinity. Viewed in its fullness, this wonderful symbol contains the key to man's past evolution, his present constitution, and his future development, together with the method of attainment. In the form where it is represented with a single rose in the center it symbolizes the indwelling Human Spirit radiating from itself the four vehicles: the dense, vital, and desire bodies, plus the mind. But there was a time when that condition did not obtain, a time when the threefold Spirit hovered above its vehicles and was unable to enter. Then the cross stood alone without a rose, symbolizing the condition which prevailed in the early third of Atlantis. There was even a time when the upper limb of the cross was lacking and man's constitution was represented by the Tau (T). That was in the Lemurian Epoch when he had only the dense, vital, and desire bodies. Then the animal nature was paramount Man followed desire without reserve. At a still earlier time, in the Hyperborean Epoch, he was also minus the desire body and possessed only the dense and vital bodies. Then man-in-the-making was like the plants, chaste and devoid of desire. At that time his condition could not have been represented by a cross. It was symbolized by a shaft, a pillar (I). Viewing our Emblem as it is today, we note that the lower limb of the cross (symbolizing matter) indicates the plant with its root in the chemical, mineral soil. The Group Spirits of plants are at the center of the Earth in the Region of Concrete Thought. From these Group Spirits flow streams or currents in all directions to the periphery of the Earth, passing outward through the length of plant or tree. The upper limb of the cross represents man; he is the inverted plant. The plant takes its food through the root; man takes his food through the head. The plant is sustained by the spiritual current of the Group Spirits in the center of the Earth, which enter into it by way of the root. The highest spiritual influence to man comes from the Sun, which sends its rays through man from the head downward. The plant inhales the poisonous carbon dioxide exhaled by man and exhales the life-giving oxygen used by him. The animal, symbolized by the horizontal limb of the cross, is between plant and man. Its spine is in a horizontal position and through it play the currents of the animal Group Spirits which encircle the Earth. 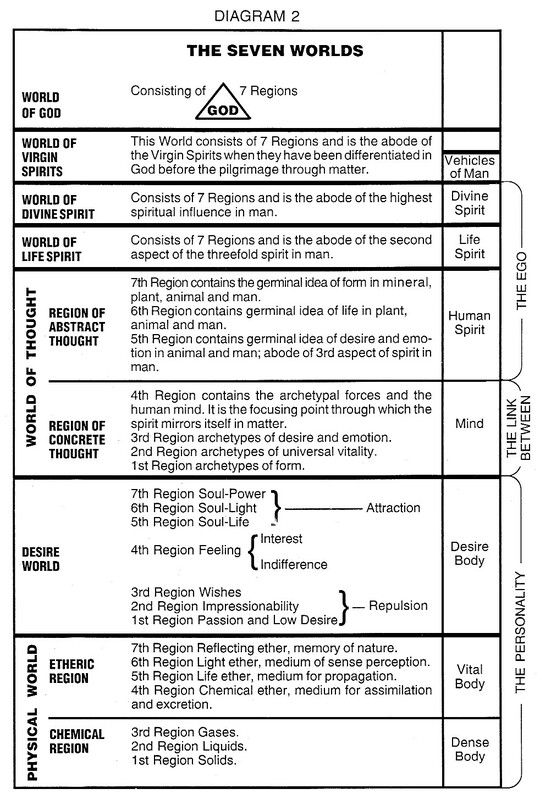 The mineral kingdom is not represented because it possess no individual vital body, and hence cannot be the vehicle for currents belonging to the higher realms. In time the present passionate mode of generation will again be superseded by a pure and more efficient method than the present, and that also is symbolized in the Rose Cross where the white rose is placed in the center between the four arms. The long limb represents the body, the two horizontals, the two arms, and the short upper limb, the head. The white rose is in place of the larynx. The seven roses which garnish the Emblem and the five-pointed radiating star behind, are symbolical of the twelve Great Creative Hierarchies which have assisted the evolving human Spirit through the previous conditions, as mineral, plant, and animal, when it was devoid of consciousness and unable to care for itself in the slightest degree. Of these twelve hosts of Great Beings, three classes worked upon and with man of their own free will and without any obligation whatever. These are symbolized by the three points in the star upon the Emblem which point upward. Two more of the Great Hierarchies are upon the point of withdrawal, and they are pictured in the two points of the star which radiates downward from the center. The seven red roses reveal the fact that there are still seven Great Creative Hierarchies active in the development of the beings upon Earth, and as all of these various classes are but parts of one Great Whole whom we call God, the whole Emblem is a symbol of God in manifestation. The red color of the climbing roses, representative of the verdant evolving life climbing to greater and greater heights, indicates the activities of the Holy Spirit of God in Nature. The human analogy is the mystery of the cleansed blood. Blood is the vehicle of egoic control of the physical body. The Ego controls the body by means of the heat in the blood. In the process of right living the vibrations of the blood are harmoniously raised, the blood cleansed from animalism and changed into the type of Blood of Christ. That is one of the processes of the Christ in us. One of the evidences of this condition is that the body becomes a more sensitive and responsive instrument of the Spirit. The poison from the bite of a venomous serpent-may be overcome and eliminated by the clean, high-vibrating fire in the blood, as stated in the Bible. The seven red roses may also in a certain sense be correlated to the ductless glands, intimately connected with the occult development of humanity. Four of these are connected with the personality; the thymus gland, ruled by Venus; the spleen, ruled by the Sun; and the two adrenals, ruled by Jupiter. The pituitary body, ruled by Uranus, and the pineal gland, ruled by Neptune, are particularly correlated with the spiritual side of our nature, and the thyroid, ruled by Mercury, forms the link between. As spiritual aspirants we receive from the Emblem the high ideal of causing the roses upon our cross to bud and bloom — that is, to unfold the latent powers of the threefold Spirit by active experiences here in the material world. The threefold Spirit, by means of the mind, governs a threefold body, which it emanated from itself to gather experience. This threefold body the Spirit transmutes into a threefold soul, upon which it nourishes itself from impotence to omnipotence. Certain specific faculties must be cultivated if spiritual attainment is to be accomplished. One of these is discrimination, the faculty whereby we distinguish the unimportant and unessential from the important and essential, thus learning that we are Spirits, and our bodies are but temporary dwelling places, instruments for use. Discrimination generates the intellectual soul and gives man his first start toward the higher life. Observation is another important faculty: the use of the senses to obtain information regarding the phenomena around us. Observation and right action in Relation to external impacts generate the conscious soul. Devotion to high ideals is also necessary, for it acts as a curb on the animal instincts and evolves the emotional soul. By following the Path resealed to us by the Emblem we unfold the powers of God Himself — we become able to do the things indicated by Christ Jesus when He said: "He that believeth on me, the works that I do shall he do also; and greater works than these shall he do." (John 14:12) Among the powers He possessed, as we know from His works, were clairvoyance, clairaudience, prophecy, teaching, healing, casting out devils, and controlling the elements. All these powers may be ours, too, as we live so as to make the roses bloom upon our cross. The alpha and omega of our spiritual aspiration on the Path of Attainment may be said to be symbolized by the white rose used in the Healing Service. It stands for the heart of the Invisible Helper, purified, harmless, and free from all personal desires. In our daily struggle to conform our lives to the Divine Plan we are building the soul body, the body of light in which we can function as Invisible Helpers. Let us meditate often on the Rosicrucian Emblem, raising our consciousness in contemplation of the high ideals held up before us in this mystic symbol. Then the forum of Truth will become established within us and we will day by day develop an awareness of the greatness of God's plan and His love for us.